Ok, I know there are a few guides and posts in various places on the forum about wiring up a subwoofer to the stereo system in the Fiesta Mk7/7.5. Some of the posts do mention the RCA adaptor to convert high level output to low level input for a sub. None of the guides/posts, however, actually contain an install done using an RCA adaptor. 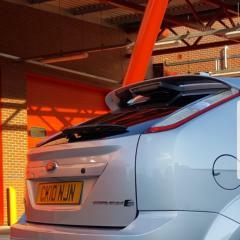 Has anyone actually used one in a fiesta Mk7.5? Secondly, the adaptor I purchased has 5 wires. Only 4 of them are described on the packaging (2x front left and 2x front right) but there's a 5th wire with no explanation as to what it does. Anyone know what that 5th wire is? I'm guessing possibly ground? Lastly, I'm unsure of the colour coding for the stereo loom so don't know which ones are Speakers and which ones are the right ones to tap into. Would anyone be able to shed any light on this and help me wire the speaker outputs correctly by identifying which wires to use? So, can anyone actually tell me which are the speaker wires I need to tap into? Thanks Tom. I shall go out tomorrow and test it all out. Do you have any ideas as to what the 5th black wire could be on the RCA adaptor? plesse note this was on a focus mk2.5 titanium with sony dab unit ,as i did this . just compare with your car s loom. this is only a guide not instructions . so do research before going shesd .